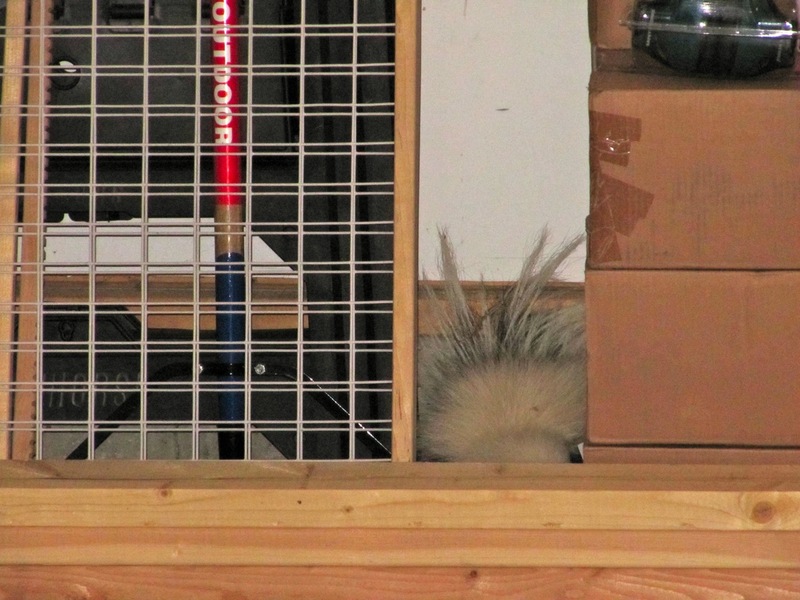 There is a skunk currently roaming around our garage. 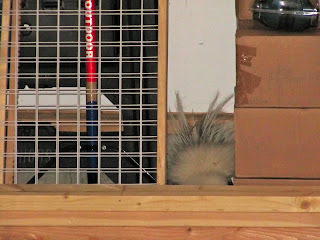 She (or he) can be seen in the picture above, hiding between some stacked boxes and a baby gate. I was in the garage getting some clothes ready to donate to charity when I spied this little critter walking around behind me. Being the big brave girl that I am, I ran into the house faster than you can say stinky pants. Skunks smell even when they are not in the act of spraying. This creature, although cute, smells nasty. Skunks cannot be lured out of your garage with bananas. That apparently only works for monkeys. Paper towels soaked with ammonia and lobbed at a skunk's head do not phase the skunk. Banging a spoon on a pan serves no other function than to wake your neighbors. It will not make the skunk get up and march out the door. Tell It Sarah Palin is comin' over for dinner with some of her NRA pals. That's a brazen and stubborn little stinker. Moth Balls. They don't like moth balls. And they are more likely to leave the garage (their home) at night. I can get you a "Have a heart" trap, that won't hurt them. Then you can move them out into the woods, or to someone elses yard. --- no go, eh? LOLOL Who would have thunk? So- what happened? We need a follow up!!!! I'm sorry to admit I have had the same experience, plus my furry friends tired to help and made matters worse. Moth balls do not work on southern skunks and a Live trap you have to pick up in person to relocate the cage. I lured mine out with cheese and bread like a bread crumb trail. Once out he did not return on his own. I don't think the cheese agreed with him. Personally, I would call a professional animal trapper who uses a live trap. My dog was sprayed by a skunk and I swear the smell stayed on him for a year. I just hope he or she is not making a nest in your garage. Yuck, that was my first thought, couldn't you smell it before you seen it. I know the closer you get the worse it is. Good luck on getting he/she out. I'd would have loved to Jude but I was too chicken to get any closer. I zoomed in as far as I could but she just wouldn't pop her head up. Solo - that worked! I mentioned Tea Party Express with Sarah Palin and the thing went running for the hills. She's brave Chewy. Doesn't seem to care if people or dogs are around. But you know skunks these days. They are not respectful like the skunks of our youth. Hey Mrs. M - thank you for the advice and for the offer. The critter decided to leave after a couple of hours. But I have a feeling she may be back. She looked awful cozy in the garage and seemed to be on a mission. All clear for now CIW. But as I mentioned above to Mrs Moto, I wouldn't be surprised if the skunks thinks the garage is a one bedroom condo in move in condition. Hey Tomboy - So what did you use to initially wash the dog after he/she was sprayed? Any tricks you know of that would help if one of the dogs gets hit (or if I do). Thanks Dragon. They really do carry that nasty scent. I imagine if they let it really rip it would make your eyes tear up. Yes, I would have suggested Animal Control. Maybe they can give you some advice. Do you know how the critter got in the garage? Block that spot! We keep our dogs food bowl in the garage, and I make sure that the side door is shut each night to keep the skunks and raccoons out. We got sprayed last year (well, the dog did and then ran through the house) and we didn't get the stink out for months. Tomato juice does not work. Repeated washing with detergent helps. FYI: a bath in tomato juice neutralizes the "odor" should your pet (or gf) get sprayed! Even if you go to the ER, that's what they'll do for ya....at least, ahem, that's what I've heard.